When you circumambulate a Shiva temple in South India, you see the images of the 63 Nayanmars placed on the same level as other forms of the Lord. If it is a Vishnu temple, these are replaced by the 12 Alvars. All these were devotees, the Nayanmars of Shiva, and the Alvars of Vishnu, who sang the praise of the Lord, and eventually merged with them. It is extremely interesting to see just how important these devotees are considered, for, who would know of the Lord and his greatness, if not for these saints, who sang his praises? Among all the temples we visited during our Tirunelveli trip, nothing illustrates the importance of these saints more than the 9 Vishnu temples on the banks of the river Tamirabarani, which make up the Nava Tirupati circuit. For, it was the greatest among the Alvars – Nammalvar, who sang of these temples, and tied them with a common thread. Each temple, though dedicated to a different form of Lord Vishnu, is also dedicated to one of the nine planets, embodied in the form of the Lord himself. Even today, once a year, all the nine deities come together, to hear the saint sing verses in their praise. This scene is enacted in May/June each year, with images of the deities brought together on their vehicles. An image of the saint is brought too, and the priest recites the verses dedicated to each of them. Further, the image of the saint is taken in a palanquin to each of the nine temples, and verses related to each shrine are chanted in the shrine itself. The Nava Tirupati circuit is one of the most popular ones in Tirunelveli, and our aim this morning was to visit all the nine temples in the shortest possible time. Thankfully, our driver was familiar with all these temples, so we rushed through, completing the circuit in just half a day! This is the order in which we visited the temples….. The Lord at the temple of Srivaikuntam is Vaikunthanathar, the Lord of Vaikuntha. The earliest legends speak of the time Brahma lost the Vedas and prayed to Vishnu, to help get them back from the demon who had stolen them. Vishnu was pleased, and he restored the Vedas to Brahma, after killing the demon. It is said that the Lord agreed to stay back here, at Srivaikuntam, in the form he had blessed Brahma. Far more interesting is another story, where the Lord comes to aid a thief! As the story goes, a thief, who has stolen from the Royal Treasury, prays to the Lord, asking for his protection. The Lord takes the form of the thief, and surrenders to the king. Justifying his act, the Lord further advises the king, that such acts only occur when the king hoards his wealth instead of sharing them with his subjects. The king, thus chastised, finally realizes that it is the Lord himself, and falls at His feet. He then changes his ways, and the kingdom thrives. Since he helped a thief, the Lord is affectionately called ‘Kallapiran’ – Kallan in Tamil is a thief, and he is thus, a friend of thieves! Srivaikuntam once was a stronghold of the Pandyas, and the temple is a beautiful one, with many life sized sculptures as well as ancient paintings. Especially beautiful and eye capturing are the sculptures depicting Rama with his hand around Sugreeva, and another of Lakshmana, with his arm around Hanuman. The many mandapams have life like sculptures of mythical animals, deities, and also patrons of the temple. Very interestingly, the depiction of the Dashavatar in this temple is the same as at Mannarkoil (see previous post, and for photos, click here.). In the main sanctum, the Lord is in standing posture, with Adishesha spreading his hoods over his head. Among the Nava Tirupatis, the lord here represents Surya, the Sun God. Location: Srivaikuntam is located about 30 Km from Tirunelveli and 30 Km from Tiruchendur. 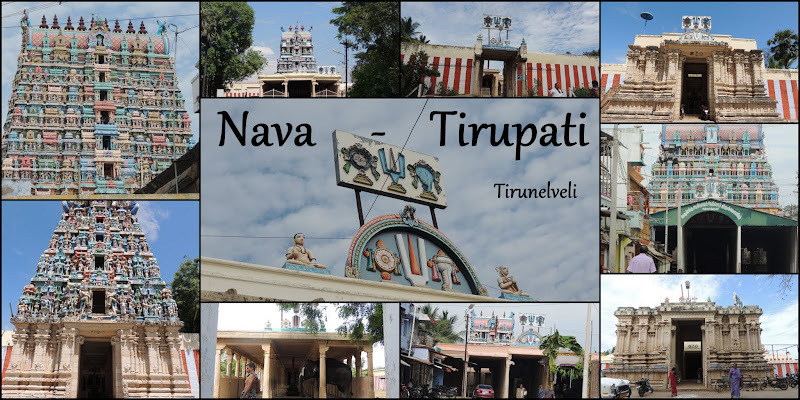 The Nava Tirupati circuit traditionally begins with the temple at Alvar Tirunagari, since it was here that Nammalvar was born. (We however, didn’t follow the circuit exactly, so this was the second stop on our route.) It is believed that Nammalvar was born here, though he remained silent, and sat in a hole in a tamarind tree to meditate. His presence was felt by another saint, Madhurakavi, who approached him and spoke to him in riddles. When Nammalvar gave the perfect answer to his questions, Madhurakavi knew he had found his guru. The town was then known as Kurugoor. It is further believed that as the saint sat in the tamarind tree and sang verses in praise of the Lord, the Gods came and sat on the tree to listen to him. While the deity here is called Adipiran, the earliest one, he is also worshipped as Guru, or Jupiter. Further, the tree the saint sat in is considered just as auspicious. It has been preserved in one corner of the temple, and a shrine built around it, in such a manner that the tree grows even today! The legend of Thirukkolur is an interesting one, and one that is seen in the very form of the Lord here. The story relates to Kubera, the God of Wealth. He manages to anger Parvati, who curses him to lose his eye as well as his wealth. This wealth is not the usual, but something really special – the Nava nidhis, which represent the most precious things in the world. When Kubera loses his power over them, the Nava Nidhis find their way to Thirukkolur, and find protection with Lord Vishnu. The Lord here is thus, Vaitamanidhi Perumal (the Lord who has the Nava Nidhis). He is seen in the sanctum in a sleeping posture, using a measuring vessel as his pillow, his arms not relaxed, but alert, as if on the lookout for robbers! Kubera of course regrets his actions and apologizes to Parvati, who relents and advises him to bathe in the river Tamirabarani at Thirukkolur, and pray to the Lord to get back his power. The Lord is also called Nikshepavittan, to whom you surrender everything, in complete trust, without any sort of agreement or binding. The name refers not just to Kubera’s wealth, which the Lord guards without any binding to do so, but also to our own devotion, which we offer to him, without any expectations. Here, the Lord is also worshipped as Angarakan, or Mars. Besides, this is also the birthplace of Madhurakavi, the one who discovered Nammalvar in the tree and accepted him as his guru. The town of Thenthirupperai gets its name from the goddess of earth, Bhudevi, who performed penance here, to free herself from a curse by the sage Durvasa. When she bathed in the Thamirabarani River, she found a pair of fish shaped earrings. They were so beautiful that she wanted to see her Lord wearing them. She prayed to Lord Vishnu, who appeared, accepted the earrings, and freed her from her curse. The town came to be known as Sriperai, or Thiruperai, the sacred place where the goddess performed penance. The Lord too, stayed on, wearing the earrings. He is thus called Makara-Nedunkuzahai-Kathar (wearing fish shaped earrings), and is seen in a seated posture, with his consorts, Bhudevi and Sridevi. He is worshipped here as a form of Sukra, or the planet Venus. Location: Thenthirupperai is about 4 Km from Thirukkolur. The Irattai Tirupati are two temples, located in the same town, barely 500 m apart. While, among the 108 Divya Desams, they are counted as one, among the Nava Tirupatis, they are considered separate temples, and represent the planets Rahu and Ketu. The word, ‘irattai’ in Tamil means twins, and these are indeed twin temples, so close are they located. The town is named Tulai-Villi-Mangalam, and, as usual, there is a legend associated with it. It is said that the sage Suprabhar relieved a couple of a curse by Kubera. They had been transformed into a pair of scales (tulai) and a bow (vil), and the sage’s touch had transformed them back to their original selves, and the place came to be known as Tulai-Vili-Mangalam. Further, the sage continued his penance here, and obtained nectar. When Lord Vishnu appeared here, along with the Devas, he offered the nectar to the Lord, and asked him to stay on. Thus, the Lord is seen here, standing, and is called Devapiran. Location: Irattai Tirupati is around 9 Km from Thenthirupperai, and 8 Km from Thirukkolur. Note: Both temples are open at the same time, but the same priest attends to both, so the main shrine remains closed while the priest is at the other temple. Before you enter the temple, check with the watchman as to which temple the priest is in, and visit accordingly. Also, these are the most isolated among all the temples in this circuit, but recently, rooms have been built by the trust, and you can stay on here, if you wish to perform any special puja. There is also a small local shop, selling craft items made by the women of the villages nearby. The second temple at Tulai-vili-mangalam, or the second among the Irattai Tirupatis, is the Aravindalochar Temple. It is said that the Ashwini twins worshipped Lord Vishnu here with red lotuses, and he is also called Senthamarai kannan. Perungulam – the word literally means ‘big lake’, and indeed, the lake was the most fascinating thing about Perungulam, especially since I managed to spot a few birds nearby, and coots swimming in the water! The original name of the town, however, was Thirukulandai. It is said that the Lord arrived here to marry Kulandaivalli, the daughter of a Brahmin, who performed penance so she could marry the Lord. He is seen here, in a standing posture, with both his consorts by his side. Further, he is also called Mayakoothan, the one who killed a demon, and danced on him! In this temple, he is also worshipped as Saneeshwara, or the planet Saturn. When we arrived at the temple, the priest was away, so we thought the shrine would be closed. Instead, seeing us arrive, the priest’s son came forward, opened the shrine, and conducted the puja for us. He did the puja with such dedication and chanted the mantras with such clarity, that it was an incredibly satisfying experience! The temple at Thirupuliangudi is a beautiful one, but the most striking thing here is the Lord Himself. He is seen in sleeping posture, in Bhujangashayanam, head resting on his hand, on Adishesha, with Brahma on the lotus, emerging from His navel, and Lakshmi at His feet. He is huge, and one can just go on looking at him, entranced! There is a small window near His feet, which allows light to fall on His face, lighting it up naturally, adding to the effect. Besides, while doing the pradakshina, you can look through the window, and catch a glimpse of His feet, which aren’t visible from the front. Here, he is called Bhoomipalan, the protector of the earth, and he also represents Budhan or Mercury. Location: Thirupuliangudi is about 9 Km from Perungulam, and about 3 Km from Srivaikuntham. Timings: 8 AM to 12 Noon, 1 to 6 PM. The village is called Natham, though the original name, still mentioned on the temple board, is Varagunamangai. The name seems to suggest an association with Varaguna Pandyan, but there was little we could learn about him. The Lord here is Vijayasana Perumal, the one seated on a throne, with his consort, Varagunavalli. It is believed that the Lord appeared in this form to sage Romasha. Here, he is also worshipped as the Moon, or Chandran. The temple has been recently renovated, and while some of it has been restored exactly as it must have once been, the gopuram has been painted in bright colours, which brings out the beauty of the stucco figures. From the Dashavatar to Krishna dancing on Kaliya, and even a figure of Harihara, this a beautiful gopuram indeed, even though it appears to be quite new. Location: Natham, or Varagunamangai is about 1 Km from Thirupuliangudi and 3 Km from Srivaikuntham. Timing: 8 AM to 12 Noon, 1 to 6 PM. And that brings us to the end of our Nava Tirupati tour. We managed to finish all these before lunch, which was quite a feat, which meant, as usual, that we didn’t have as much time as we would have liked at each of the temples. However, we had other temples, and another circuit on our list, so we had no choice but to hurry! Meanwhile, if you are planning a trip here, you can easily finish them all in a day, keeping enough time to explore each temple. Articles in The Hindu, by Pradeep Chakravarthy. These are beautifully written, with references to the songs sung by Nammalvar at these temples. Do read before you plan a trip.